The Anti-Oxidant Rejuvenating Hand Cream helps improve the look of unwanted pigmentation, discoloration, and age spots. 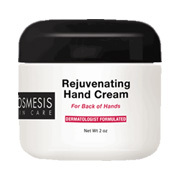 The specialty cream helps minimize the appearance of dry, dehydrated, and veiny skin on the back of the hands. The Anti-Oxidant Rejuvenating Hand Cream has been specifically formulated with potent anti-oxidants, vitamins, tea extracts, and powerful anti-aging ingredients for improvement of the skin on the back of the hands. Additionally, the Hand Cream can help reduce the noticeable signs of aging of the skin on the back of the hands. Apply one to two times daily on the back of the hands. Distilled water, Acetyl Glucosamine, Nicatinamide, DMAE, Alpha Lipoic Acid, Cu Complex, Co-Enzyme Q10, Carnitine, Vitamin E, Retinol, Grape Seed Oil, Orange Flower, Neroli, Chamomile Sage, Bergamont Tea, Emulsifying wax N.F., Avocado Oil, Soyabean Oil, Glycerin, Hyaluronic Acid, Silicones, Concentrated Tea Blend Extract. Anti-Oxidant Reiuvenating Hand Cream - is shipped in a discrete, unmarked package. Orders are processed immediately and usually take about 3 to 5 working days to be received. We do ask that you try it for 2 to 3 weeks to feel the full effects. Any information received is used only for order processing and shipping purposes. Your information, such as e-mail address, will never be disclosed to a third party.